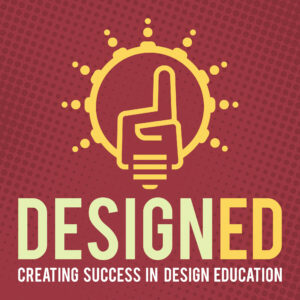 The DESIGNED Podcast is a professional broadcast quality podcast exploring art and design studies for educators, mentors, students, and practitioners that are pursuing success in their work. The mission of The DESIGNED Podcast is to create motivational dialog and encouraging discussion on art and design education to a national audience of educators, mentors, students, and practitioners in an ever-changing creative and visual arts field to promote and inspire the studies and professional success in art and design. The vision of The DESIGNED Podcast is to generate conversation for current and future educators, mentors, students, and practitioners on the ever-changing environment of art and design to initiate exploration and insight into a transformative experience successively refreshing and invigorating the future potential of artists and designers. Throughout history art and design education and practice has continually been exposed to countless challenges brought on by the continuous flux in society and culture. Today we face new demands and exigence’s indicating change is essential to the success of art and design education and practitioners. Therefore, teaching, learning, and practicing art and design in transformative times requires new perspectives. In this ever-changing creative and visual arts arena, we find that knowledge, competencies, and skills have become fragmentary and there is a need — perhaps now more than ever before — to cultivate ideas that will progress our strategies and actions to advance art and design education and professional success for artists and designers. The DESIGNED Podcast offers a platform for the exchange and delivery of dialog that will promote and encourage ideas to bring the necessary transformation to an ever-evolving discipline of art and design. Podcasting, in both audio and video formats, are a great way to reach an audience. Audio podcasts are easy to consume while commuting, exercising, or getting work done. Video podcasts make it possible to connect on a deeper level, make it easier to communicate visual subjects, and are more engaging and relatable. The DESIGNED Podcast will be a professional broadcast quality podcast that will utilize both audio and video platforms using video to enhance the audio podcast and deepen the relationship with audio listeners. The DESIGNED Podcast video podcast will utilize a multi-cam setup that can also feature multiple remote guests via video cameras and webcams. Utilizing these formats, The DESIGNED Podcast episodes will be recorded and edited then uploaded onto a website designated for The DESIGNED Podcast while simultaneously released to multiple channels and directories dedicated for audio and video podcasts. The recording of episodes will be on an ongoing basis as guests are available while the release of episodes will remain on a semi-monthly basis. Episodes will be broken into seasons that correlate with academic calendars i.e. fall, spring, and summer. Each season will consist of 8 episodes, resulting in 24 episodes a year. Podcast guests will be a collection of art and design educators, mentors, experts, professionals, authors, and students. Topics will address a variety of subject matter, but not inclusive to, the state of art and design education, expectations in academia and the professions, opportunities and challenges, suggestions and successes, and countless other topics that contribute to creating success in design education. I am an artist, designer, and a design educator. Currently I’m an Assistant Professor of Art focused in Graphic Design at the University of Central Arkansas (UCA). I have a MFA in Graphic Design from Savannah College of Art & Design, a MS in Marketing, Communications, and Information Technology from Rochester Institute of Technology, and a BFA in Graphic Design also from Rochester Institute of Technology. I have taught a variety of art and design curriculum ranging from foundations, typography, branding, and advertising as well as packaging to graphic design history. In addition to my academic career I have accrued over thirty years of expertise and maturity as a senior graphic designer and art director, radio host, and public speaker with experience encompassing communications, public speaking, public relations, marketing, advertising, publications design, in-house design, and freelance design.